Namratha's Musings: Living on the Jagged Edge! Living on the Jagged Edge! "Indecision becomes decision with time". Instead of taking control of the situation, sometimes we let the situation take control of us. Decision making - an essential leadership skill - is identifying and choosing alternatives based on the needs and demands of a given situation. Timely, well considered decisions can lead the team to success. Decision making is part of every ones life. On a daily basis, we make decisions on what time we get up to what we eat. We consciously make some of the decisions , some we let others make a decision for us and some we let the situation make the decision for us. When we have people depending on us, when we are in a position of control such as being a parent, being a professional where company depends on you, you cannot always let the situation control you. While Decision Making is a complete science of its own, I have found the “Jagged Edge” decision making technique very useful. This was taught to me informally by my senior manager about 10 years ago and has always come in handy while making decisions. I fondly named it the “Jagged Edge” decision making technique. Decision making does not necessarily need for the decision maker (DM) to be an expert in the domain. You need to be able to ask the right questions and be able to judge the people giving the answers. The decision maker needs to evaluate all the information he/she has and base the decision on it. DMs typically fail because they do not choose the right advisers, or don’t listen to them when they should. If you are working on cutting edge technology, most times all the data necessary to make the decision is not available. 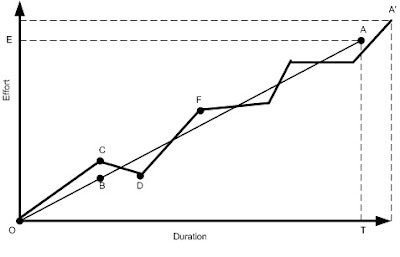 Consider the following graph, where an activity A has to be completed. It would take an estimated duration of T and effort E if done in absolutely the most efficient way. But typical projects would take the jagged route shown in the graph. At the point O, the DM would not have all the information necessary, but makes a decision to follow the path OC. If all the data was available to the DM, the decision would have been OB – the most efficient way. The DM has to keep in mind that he/she didn’t have all the data and is taking some risks. The risks have to be well understood, documented and have a time line to reevaluate. The team starts working along the path OC, when the trigger for the risk time line is up (at C), the DM reevaluates the decision and needs to readjust to CD and DF and sets a checkpoint at F.
Assume at point O, the DM didn’t make a decision because all the data is not available. No progress would have been made. But instead the team was able to make progress towards their goal of activity A. There was some wasted effort but large percentage was towards activity A. Seasoned leaders make quick decisions and re-planning such that the jagged edges look smoother. Sometimes, the teams under such leaders don’t even feel the readjustments. You need to be aware that the decision is not taking the team in a completely different direction and eventually end up with 100% wasted work. Most times, with experience and Gut Feel, you will be able to drive the team in the right direction, if not the most efficient path. Some things overlooked by DMs are to not set a trigger point based on the availability of next set of data, not understand the risks due to non-availability of data, and to re-evaluate at the trigger point. Another important item often overlooked in implementation is the need for buy in from the implementers. There is a need to not only explaining the benefits but to also explain the risks and drawbacks involved. Implementers will only support your decision if they understand both the risks and benefits and DMs commitment towards the decision. Going back to the blog starting point - "Indecision becomes decision with time" - don't let the situation take control of you, take control of the situation. Even with lack of complete data you will be able to make progress most times. If you delay the decision making, eventually the situation takes over and you are only left with very few alternatives.